Course Description: This course introduces students to information and communication technology in a business environment and builds a foundation of digital literacy skills necessary for success in a technologically driven society. Students will develop word processing, spreadsheet, database, desktop publishing, presentation software, and website design skills. Throughout the course, there is an emphasis on digital literacy, effective electronic research and communication skills, and current issues related to the impact of information and communication technology. In this unit students will create an electronic information technology reference manual of terms, and explain the key infrastructures related to information technology. In this unit students will enhance and/or develop their basic software application skills using specific application software, investigate web-page design software and Internet search engines, and assess their data entry skills on an ongoing basis. In this unit students will complete readiness and remedial exercises and use electronic tools to enhance and/or develop their communication skills, develop an understanding of what e-mail is and how it works, investigate a variety of topics related to electronic communication, and apply their new, electronic-communication skills to create an electronic presentation. This unit investigates information gathering from a variety of electronic sources. 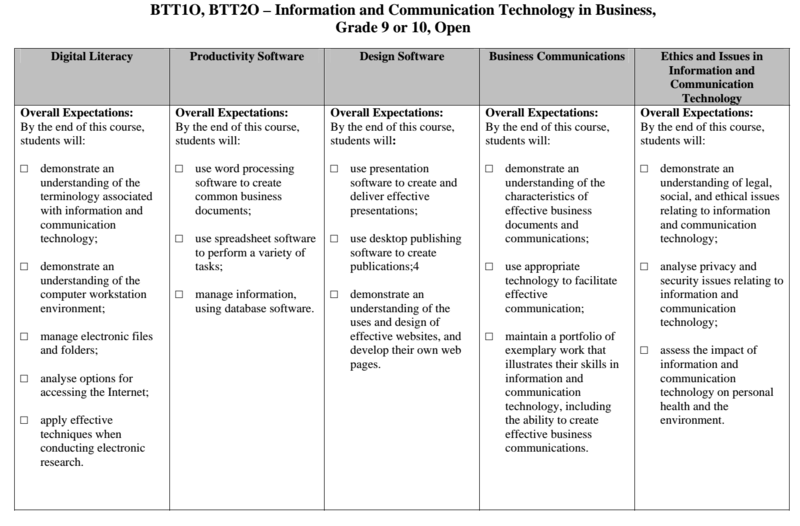 Students develop evaluation criteria to evaluate the electronic information gathered with respect to validity, bias, usefulness, confidentiality, and the degree to which it is up to date. Students develop an understanding of Internet connections, investigate dangers that are associated with transmission of information, and apply research and critical thinking skills in researching the business. Students learn about communication etiquette of a designated culture and apply their research findings to a variety of formats to be shared with classmates. This unit asks students to investigate information technology options in their school or work, and revise their information technology growth plans based on this newly-acquired information. Students will assemble a booklet consisting of different information technology job advertisements.